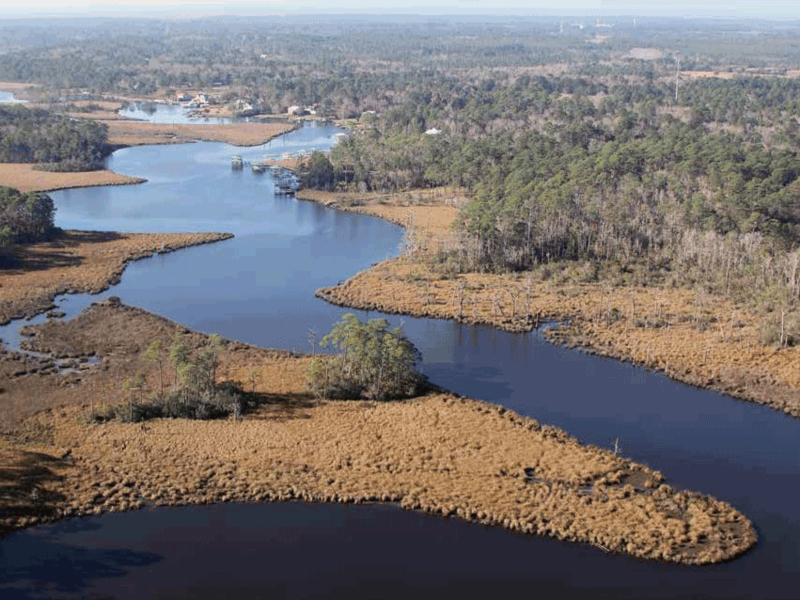 In 2013, the Mobile Bay National Estuary Program (MBNEP) embarked upon a holistic, watershed-based approach to guide coastal ecosystem restoration and protection measures recommended through, and including, watershed management planning. The MBNEP’s current Comprehensive Conservation Management Plan (CCMP) initiated this novel approach which prescribes development of watershed management plans (WMPs) to ensure that restoration projects are based in science and fit into an overall management program by drainage area, independent of geopolitical boundaries. The old way of doing things is giving way to a new method for managing resources along Alabama’s coast. Rather than the traditional ways of pushing problems downstream to manage off-site, this watershed-based approach focuses on managing the system closest to its source and mimicking the natural environment. Imperative to the success of this strategy is a need to reach beyond geopolitical boundaries, bringing differing governing bodies together to act as one to manage shared interests on a watershed scale. The fulcrum of this paradigm shift is the watershed plan. Watershed plans provide a vehicle to ensure a sustainable quality of life for coastal residents through setting goals focused on improving water quality and critical habitats, protecting traditional uses of biological resources, enhancing watershed resiliency to human and natural stressors, and by increasing opportunities for access to the resource. Integral to the success of these plans are partnerships built from the initial stages of the development process through the implementation of WMP recommendations that may stretch out over a decade or more. Creating a sense of ownership by engaging key stakeholders from the outset and incorporating community input and concerns to inform recommended actions generates momentum to carry the finished watershed plans forward. These WMPs are invaluable to our state’s decision-makers as they decide how best to direct limited funding available through various sources. To date over $170 million dollars in BP-related funding has been allocated to projects identified through the watershed planning process. 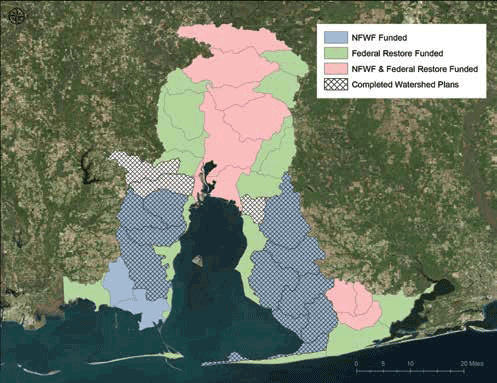 What follows is an update from each of the coastal watersheds with completed plans and a look forward to ongoing and future watershed planning efforts across Mobile and Baldwin counties. The D’Olive Watershed Management Plan set the stage and serves as the template for this watershed approach. Completed in 2010, the D’Olive WMP stressed the importance of “stopping the bleeding” from the network of deeply eroded stream channels across the watershed funneling unprecedented levels of sediment through the system, clogging tributaries, wetlands, and ultimately D’Olive and Mobile bays. Since the inception of the plan, over $12 million dollars of funding has been secured, leading to the restoration of over two miles of incised streams and their adjacent flood plains. Additionally, the cities of Daphne and Spanish Fort have adopted new standards for how stormwater is managed in the Watershed to ensure the efficacy of the restored waterways. “When we initiated watershed planning, we never thought that the D’Olive Watershed would end up being the recipient of the over $12 million in NFWF stream restoration funds. For Daphne, D’Olive Watershed Restoration is like a dream come true. It shows that proper watershed planning pays off. Under the leadership of the Mobile Bay National Estuary Program, the D’Olive Watershed Working Group created unbelievable partnerships that led to the restorations’ success. A big thanks to the MBNEP for being such a great steward of Mobile Bay,” said Ashley Campbell, Environmental Programs Manager, City of Daphne. Three Mile Creek flows 14 miles through the heart of the City of Mobile, from headwaters just west of the University of South Alabama to its confluence with the Mobile River. Once the source of drinking water for the City, the waterway had since been largely abandoned and left to convey stormwater from city streets and parking lots. The creek and its tributaries suffer from pollutants associated with stormwater runoff in highly urbanized areas: excessive nutrients, sedimentation, pathogenic bacteria, and litter. Completed in 2014, the WMP recommended a host of management measures designed to improve water quality and reconnect the community to this forgotten resource. With the stated vision of creating a transformational corridor of renewal in the Three Mile Creek Watershed, the recently formed 3MC Partnership is in the vanguard of revitalization efforts. “We need to let the community know we have this potential treasure in our backyard. It’s really important from an environmental standpoint because so many things impact the creek, from development to stormwater runoff from city streets. We have 11 neighborhoods along this corridor of various socio-economic, and racial make-up, so this is a great way to bring our city together as one community,” said Mike Rogers, Chairman, 3MC Partnership. Fowl River, its tributaries, and its surrounding watershed include some of the most pristine waterways ever assessed by the Geological Survey of Alabama. 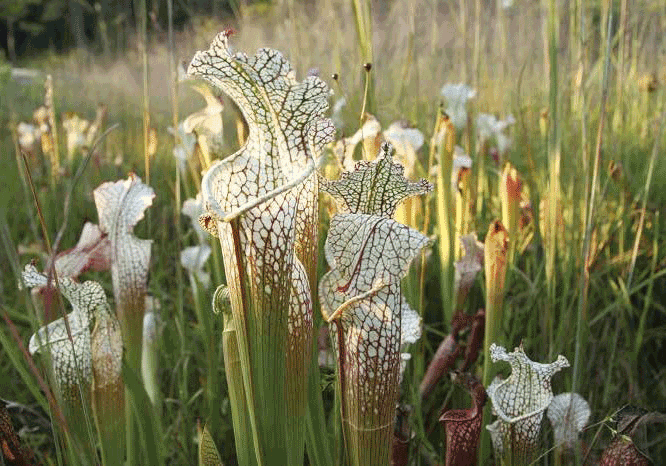 Completed in 2015, the WMP outlines a strategy of maintaining habitat and water quality by conserving the remaining wetlands, especially in the headwaters, which are facing development pressure from the westward expansion of the City of Mobile. The primary focus in the lower reaches of the river is to determine what underlying factors contribute to the loss of coastal marshland. A team of eight scientists is currently undertaking a comprehensive study of the compromised marshes, seeking to understand not only what is causing marsh degradation but also what impact stabilizing the shorelines of marsh-covered spits may have on healthy marshes downstream. health in the river and, thus, significantly improve our understanding of what is causing their degradation.” – Dr. Just Cebrian, former Senior Marine Scientist at The Sea Lab at Dauphin Island. Dog River, Halls Mill, Eslava, and Rabbit Creeks, and its other tributaries drain extensive portions of highly- urbanized areas within the city of Mobile. The recently finalized Dog River WMP reported conditions representative of habitats and water quality affected by streambed siltation, organic enrichment, litter, and other impairments associated with urban stormwater runoff. Implementation of a variety of management measures, including wetland conservation, improvements to sanitary sewer infrastructure, and reduction of stormwater runoff through improved development practices, are needed to improve the health of the greater Dog River Watershed. Funding was recently secured to acquire and conserve critical tidal marsh habitat along Perch Creek, restore hydrology, and provide recreational access by raising the DIP bridge across the Creek. Additional funding will be used to repair sanitary sewer infrastructure, reducing the incidences of sewer overflows into Perch Creek. “Having a clear picture of the current status of Mobile’s vast urban watershed is the first step toward lasting improvements. Whether it’s preventing or removing unwanted materials, increasing public access and awareness, restoring damaged shorelines or protecting critical habitat, we must have accurate scientific data to support our projects, especially the funding of those projects. Having a thorough roadmap to help guide your projects will result in a wiser use of resources with broader positive impacts,” said Debi Foster, Executive Director of the Dog River. Bon Secour River has headwaters in one of the fastest-growing metro areas in the State of Alabama, and to address the stress that places on the watershed, its WMP has recommended actions to reduce the impacts associated with stormwater runoff in urbanized areas, while focusing on protecting important habitats, like wetlands and coastal marshes, where they exist. Successes, to date, include the acquisition and protection of more than 1,000 acres of high-priority habitat and updating development standards in Foley to address stormwater management by requiring the inclusion of low-impact development practices in all new construction in the City. “Foley is working to address the management measures identified in the plan to restore and preserve the headwaters of the watershed. This includes installing a litter trap and working to acquire key properties for future stormwater mitigation projects,” said Leslie Gahagan, Environmental Manager, City of Foley. 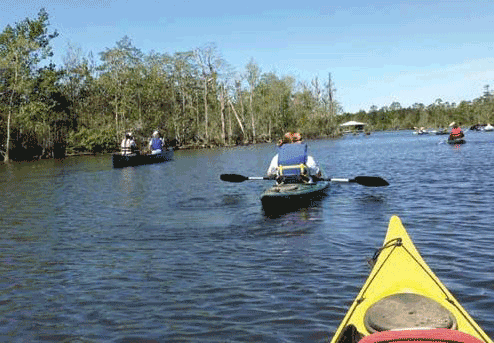 Weeks Bay is the receiving water for 362 miles of streams and tributaries, including the Fish and Magnolia rivers, that snake through the 130,000-acre watershed and drains a large swath of southwestern Baldwin County. 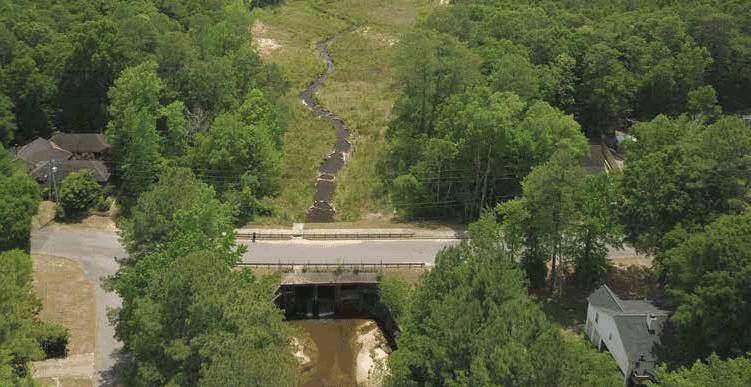 This watershed, at the epicenter of the fastest growing county in Alabama, has been impacted by stormwater runoff from urban and agricultural uses with multiple stream segments suffering water quality impairments related to nutrient loading, excessive erosion and sedimentation, low dissolved oxygen, and bacterial pathogens associated with failing sewer and septic systems. Help is on the way, thanks to the Baldwin County Soil and Water Conservation District hiring a new Watershed Management Coordinator, one of the first actions recommended in the WMP. This Coordinator will be responsible for overseeing the implementation of other recommendations of the Weeks Bay WMP. “It is vital to focus and coordinate to meet the needs of the local land user. Through partnerships, we want to make a lasting and positive contribution to the communities of Baldwin County. The Baldwin County Soil & Water Conservation District looks to the future with great hope, knowing each day we are making significant strides to protect our natural resources and provide a brighter future for Baldwin County,” said Rhonda Bryars, District Administrative Coordinator, Baldwin County Soil& Water Conservation District. Watershed plans are also currently under development for Bayou La Batre, where stakeholder concerns have centered around community resilience, and West Fowl River, where investigators are working to address issues related to pathogenic bacteria pollution in the West Fowl River Watershed that is affecting the oyster growers in Fowl River and adjacent Portersville bays. Development of a WMP for Wolf Bay is also getting underway. Lack of recreational access there and continued conversion of rural to urban land uses are issues certain to be addressed in this WMP. However, the work doesn’t stop there. RESTORE Act dollars, soon coming online, will fund development of 23 additional WMPs, encompassing the remaining intertidal watersheds across Mobile and Baldwin counties. These WMPs have proven invaluable in directing limited restoration funding to the projects delivering the greatest impact on improving coastal water and habitat quality, and in helping to secure implementation funding.